Service Catalog: Skills Catalog? What Can SFIA Bring to the Party? The subject of people and skills are often bypassed when implementing ITIL processes. The purpose of this webinar is to explore the drawing together of professional qualifications and status to underpin those working in Service Design. 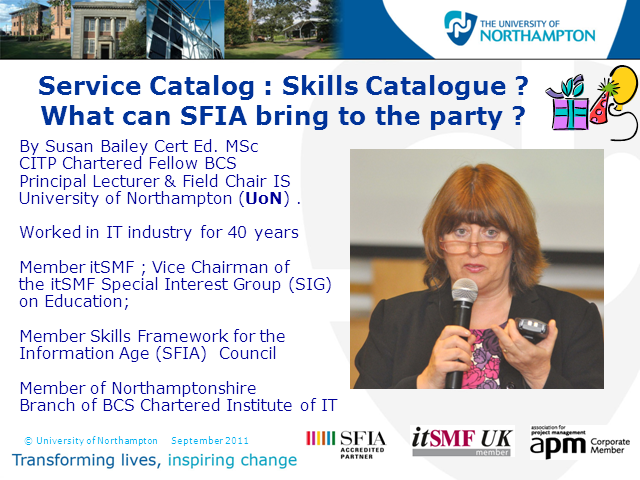 Also to ascertain what can be gained by using the Skills Framework for the Information Age (SFIA v5) in this specific area of ITIL. Title: Service Catalog: Skills Catalog? What Can SFIA Bring to the Party?